The ladies enjoyed another fantastic weekend with casting tuition and advice from Paul and Cliff with assistance from Aileen and Michael from the Annan Rivers Trust. The weekend started early on Friday evening with Paul helping the ladies attach line and backing to their new reels. Great to see four ladies purchase their first salmon rod, line and reel. Saturday morning in rather challenging conditions the ladies started fishing for salmon on Hoddom beat, by lunch time the stifling heat forced the ladies to have a break, where they spent the afternoon watching Paul and Michael tie sea trout flies in the blazing sun to use in the evening. After a BBQ cooked by Michael Head Bailiff Annan Rivers Trust (we are very lucky) the ladies fished until 11.30pm for sea trout. Two fish were caught. 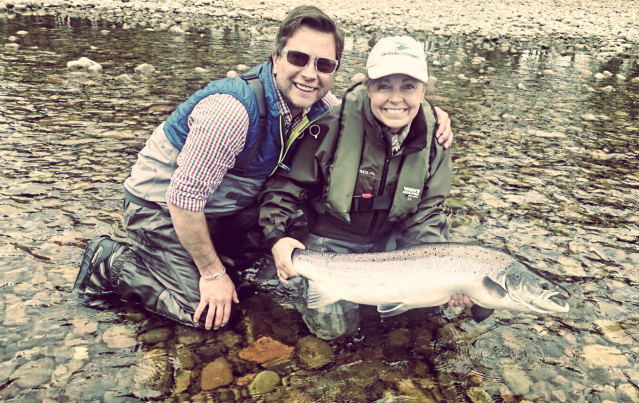 Jan: Had a brilliant weekend salmon/night sea trout/trout fishing on the River Annan. Many thanks to the River Annan Trust and staff, Hoddam Castle staff, our coaches Cliff and Paul – much appreciated. A special thanks to my fishing buddies who attended this time, it was a laugh a minute. Missed the ones who couldn’t attend but we will catch up for a spectacular weekend doing the same in August – Tight Lines!! Ps Thanks Dawn for the’Magical Mystery Tour’, wouldn’t have missed it for the world!!! Dawn Dixon Sweat shop labour …. Paul Little and Michael from the Annan Trust tying flies outside in the blazing sun. Paul has now finished the flies we are going to use for sea trout fishing later tonight. Slave labour in this heat.